Have you lost your job? You may be eligible to collect unemployment benefits while you're out of work. Eligibility for unemployment insurance, the amount of unemployment compensation you will receive, and the length of time benefits are available are determined by state law. Each state has its unemployment agency dedicated to overseeing employment and unemployment based matters. How can you tell if you're eligible to receive unemployment? Each state sets guidelines that determine whether an individual will be eligible for unemployment benefits, and how much compensation they will receive. Those guidelines also determine how many weeks of benefits an unemployed worker can collect. You'll find detailed information regarding eligibility criteria on your state unemployment website. Google "unemployment your state" to find the site. In most states, you will need to have worked for a certain period of time, met minimum earnings requirements, and have lost your job through no fault of your own. If your claim is denied or contested by your employer, you can appeal the denial. Earnings Requirements: To receive unemployment compensation, workers must meet the unemployment eligibility requirements for wages earned or time worked during an established (usually one year) period of time. Also, workers must be determined to be unemployed through no fault of their own, so if you quit or were fired, you may not be eligible for unemployment compensation. It will depend on the circumstances of your termination from employment. Eligibility Based on Type of Job Loss: A person is eligible for unemployment if he or she is unemployed for reasons other than his or her own fault, such as a layoff. If you quit or are fired for some form of misconduct, you are unlikely to be eligible for unemployment. However, if you were wrongly terminated from your position, or forced to quit, you may qualify for unemployment. Hours Worked Requirements: Additionally, most jurisdictions require a person to meet his or her resident state’s weekly requirement for hours worked or compensation earned for a specified period of time before being eligible to collect unemployment. It can be hard to determine exactly what each state’s rules are, but most people that lose steady, long-term employment through no fault of their own, will meet their state's minimum criteria for eligibility. Check with your state unemployment office for information on what benefits you are entitled to. Initial benefits may be different from weekly benefits, there may be a waiting period before you receive payment, and some states have maximum payout amounts or timelines. It's important to do your research and contact your state’s unemployment agency quickly, so you have all the accurate information you need to collect the benefits you’re entitled to. You will find information on qualifying for benefits in your location on your state's unemployment website, as well as information on what you need to do to submit a claim. In many locations, you will be able to open a claim and file for weekly benefits online. Unemployment compensation is typically paid on a debit card or direct deposited to the claimant's checking account. Unemployment Eligibility When You're Fired: If you were fired from your job, you might be eligible for unemployment, depending on the circumstances. There are a variety of factors that will determine whether you can collect benefits. If you feel you were fired without just cause, you should check with your state unemployment department about your eligibility. 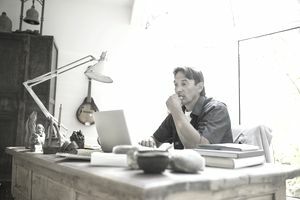 Unemployment Eligibility for Self-Employed Workers: In most cases, self-employed workers and freelance workers who lose their income are not eligible for unemployment benefits. However, if your business is incorporated and pays into unemployment, you may be eligible to collect unemployment benefits. Unemployment When You Work Part-Time: Many states provide partial unemployment benefits to individuals whose work hours have been reduced through no fault of their own. Disqualification from Unemployment: Eligibility for unemployment benefits isn't automatic. There are reasons that your unemployment claim can be denied and that you can be disqualified from collecting unemployment. Here's a list of reasons why you may not get unemployment. Unemployment Eligibility Work Requirements: In order to qualify for unemployment benefits, you must be ready, willing, available, and able to work. Review the work requirements for initial and continued eligibility. Registering with the state job service and actively seeking work is a requirement while collecting unemployment in some locations. You must be ready, willing, available, and able to work. The job service may require job seekers to apply for jobs, submit resumes, and not turn down a position if it meets certain standards. After you begin collecting unemployment, it is important and often required to file weekly or monthly claims describing your job search. Any job offers, part-time earnings, contract work, or turned down opportunities must be reported. Sometimes, there are in-person check-ins with the state or unemployment agency to discuss the status of your job search.